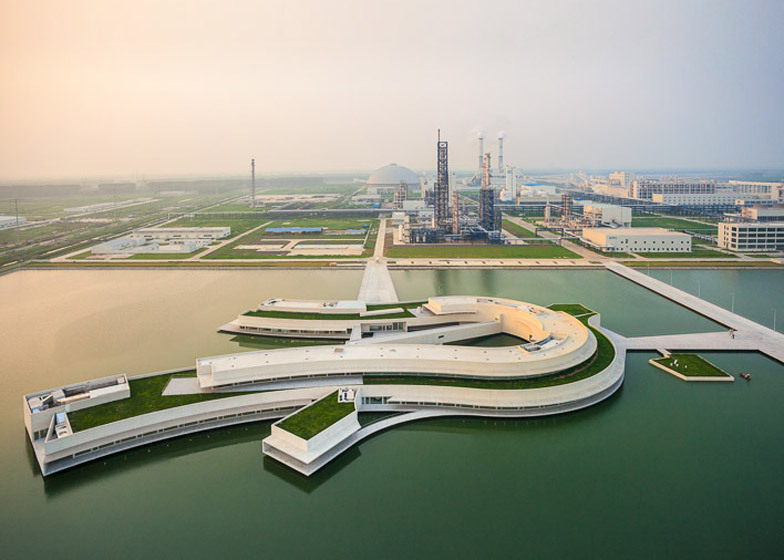 News: Portuguese architect Álvaro Siza has completed work on a large curved office building for the Shihlien Chemical Industrial Jiangsu Co in an industrial park in China's Jiangsu province (+ slideshow). The Pritkzer Prize-winning architect was appointed to design a new office building for the company's soda ash and ammonium chloride production plant in Huai'An City in 2009. Called The Building on the Water, the structure sits on an island in the middle of a 100,000-square-metre artificial lake at New Salt Industrial Park and is formed in the shape of an elongated 300-metre curve. The white concrete used to build the structure has been left exposed across the facade to create a uniform appearance that contrasts with the green roofs used on sections of the building. "Contorting itself, the form escapes from convention, an autonomous entity contrasting with the orthogonal shapes of the factory complex," said a design statement from Shihlien Group. "In constant interplay with the environment – whether it is the changing hues and reflections of the water, or varying tones of light and shadow, the building manifests a multitude of changing complexions. Whether viewed from land, water or air, the elegant building conveys a quiet beauty achieved when the concrete and substantial comes in contact with the fluid and ethereal," added the company. A total of 11,000 square metres of floor space is provided across two storeys, with bridges connecting the spaces across sections of the curve. The building is due to officially open on 30 August. "Mr. Siza has always upheld the design concept of establishing harmony between man and the environment," said Por-Shih Lin, chairman of Shihlien Chemical. "This building ingeniously blends with the waterscape and plant grounds. As the first project in China by Álvaro Siza, it will be an inspiration for future industrial plant designs in the country and is truly significant for that reason." Siza was awarded the Golden Lion for Lifetime Achievement at the 2012 Venice Architecture Biennale. Earlier this year he presented plans to build a new entrance and visitor centre for the Alhambra palace, and renovated his iconic waterside Boa Nova Tea House into a seafood restaurant last month.